The Channel Islands National Park, referred to as “The American Galapagos,” encompasses five remarkable and remote islands right off the Ventura coast: Anacapa, Santa Cruz, Santa Rosa, San Miguel and Santa Barbara. The Channel Islands and encircling waters are home to over 2,000 plants and animals, of which 145 are found nowhere else in the world including the Island Fox. Established as a National Park in 1980, each of the islands is a fascinating world unto itself. World class diving, hiking, kayaking, sea cave exploration, photography, snorkeling, camping, wildlife and wildflower viewing, the Channel Islands offers uninterrupted time with family and friends while relaxing to the soothing sounds of the natural world. The Channel Islands National Park Visitor Center features a bookstore, gift items, live tidal pool with daily talks, viewing tower, and exhibits featuring the unique character of each park island. The viewing tower offers one of the best views of Ventura Harbor, the Channel Islands, and the Ventura coastline. Visitors can also enjoy the newly released high-definition 25-minute movie entitled, “Treasure in the Sea”, narrated by Kevin Costner. Island Packers, the official concessionaire to the Channel Islands National Park, offers both landing and non-landing trips to all five islands. Landing trips provide the perfect setting for island hiking, camping, and kayaking. Non-landing trips include whale watching into the waters of the Santa Barbara Channel and the Channel Islands National Marine Sanctuary to view the larger of the marine mammals, the Pacific Gray Whales and Humpback and Blue Whales. In addition, Island Packers also offers Wildlife Cruises featuring a three-hour narrated tour along the rugged north shore of Anacapa or Santa Cruz Island with highlights including sightings of sea lions, seals, and island birds. The Channel Islands National Park and Marine Sanctuary offers world-class diving options. 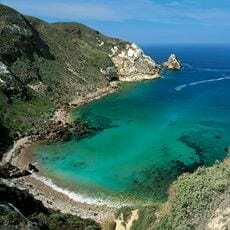 Lush with kelp forests and teaming with marine life, diving at the Channel Islands – Santa Cruz and Anacapa Islands are very accessible from the Ventura Coast out of Ventura Harbor. Ventura Dive & Sport offers dive lessons and dive rentals on site at Ventura Harbor Village. Several options are available from overnight boat trips to day dives. A variety of dining options await you at Ventura Harbor upon return. Overnight at Four Points by Sheraton or Holiday Inn Express and Suites in the Ventura Harbor before or after your dive trip. Channel Islands Kayak Center arranges kayak tours or rentals to the Channel Islands, and is located next to Islands Packers in the Ventura Harbor. Join a kayak sea caving tour, or rentals include easy to use sit-on-top ocean going kayaks, a full safety briefing, map of the island caves and up-to-date weather information before your trip. For reservation information visit www.cikayak.com. Channel Islands National Marine Sanctuary encompasses 1,470 square miles of the ocean environment surrounding five of the eight California Channel Islands – Anacapa, Santa Cruz, Santa Rosa, San Miguel and Santa Barbara. . Beautiful waters and pristine anchorages also make the sanctuary a popular year-round destination for recreational boaters and kayakers. Chartered sailing adventures are available out of Channel Islands Harbor and guided kayaking trips as well as rentals are available through the Channel Islands National Park’s visitor services page. SCUBA divers can enjoy word class dive sites and even view some of the protected wrecks within the sanctuary – check with local dive vessels for available trips and remember to please look but don’t touch. The sanctuary is also a popular destination for recreational fishing, with many chartered trips available out of local harbors. Know before you go: the sanctuary also has a network of Marine Protected Areas with 11 marine reserves that prohibit all fishing activities, and two marine conservation areas that allow limited take of lobster and pelagic fish.